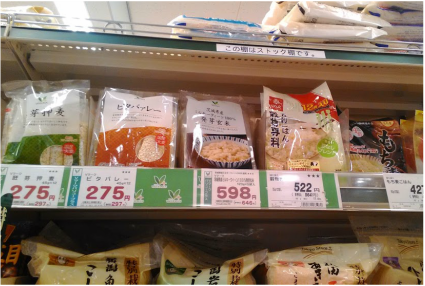 Unless you go to a rice specialty shop, you wouldn't see much unpolished brown rice on the shelf, instead you will see various types of brown rice and grains to mix with your usual white rice. In general, brown rice needs to be polished to get rid of the bran, or cooked in a pressure cooker to soften the rice. But the brown rice you see in the supermarkets are mostly the easy cook types which allows you to cook in the same way as white rice. 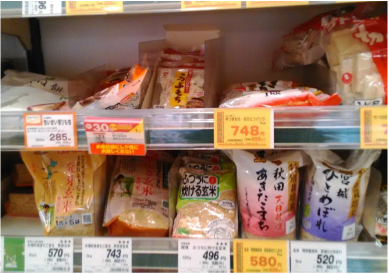 Easy Cook Genmai (ふつうに炊ける玄米）Easy Cook Brown Rice - This brown rice can be cooked in the same way as the white rice. Hatsuga-Genmai（発芽玄米）Germinated Brown Rice - This rice is softer than brown rice yet it retains the health benefits of brown rice. Gokoku-mai（五穀米）Five Grain Rice - A mixture of various grains and beans. Oshi-mugi（押し麦）Pressed Wheat - Wheat that is pressed for easy cooking. It contains more 20 times more fiber than white rice. Health conscious people will mix some brown rice to the white rice. I personally mix germinated rice to the white rice (1 part to 2 or 3 parts). Most brown rice does not need rinsing but make sure you check the package. You will see the brown rice and pressed wheat in small packages as they are mainly for mixing with the white rice. A selection of germinated rice and easy cook brown rice. Place 2 cups (360 ml) of washed white rice and 1 cup (180 ml) of germinated rice in the rice cooker. Pour water to the usual 3 cup line. Add an additional 3 tbsp water. Cook as your normal white rice. If you are cooking in a pot, soak the rice for 30 minutes before cooking and steam 15 minutes after removing from heat.